Dutch mapmaker and publisher. Born in Elberfeld, Germany in 1660. Moved to Amsterdam in 1683 where he became a pupil of Gerard Valck. 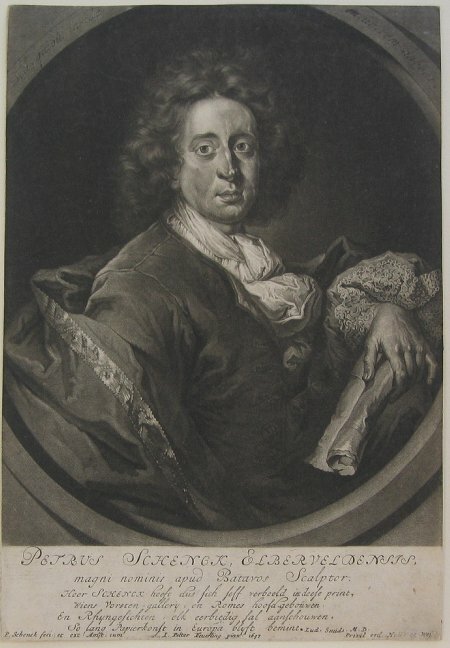 He soon became an extremely skilled exponent of the so-called zwarte kunst (mezzotint engraving). In 1686 he is noted in a privilege granted to Petrus Schenck and Gerardus Valck for the printing & sale of their prints. Schenck maintained his links with his native Germany and had a shop in Leipzig, which was taken over by his son Pieter II. On 02/11/1687 he married Agatha Valck, sister of his associate. His cartographic works did not commence until around 1695, until that date being confined primarily to topographical, architectural and portrait drawings. His addresses in Amsterdam included Beurssluys, and after 1706, on the Vijgendam "in Sanson's Atlas". His marriage produced 4 children, the eldest Maria [b.1690] marrying Leonard Valck [1675-bef.1755], son of Gerard Valck & her 1st cousin. They subsequently moved to the famous Wakkere Hond (Hondius' House) on the Dam. There were also three sons, Leonard [1696-1767]; Pieter II [bef.1698-1775] & Jan [1698-1752]. Leonard carried on his father's art & printshop after his death. His son Pieter II settled in another famous Amsterdam publishing house "in Visschers' Atlas" where he continued his association with Gerard & Leonard Valck. Pieter Schenck the Elder's earliest cartographic productions were a number of maps after Nicolas Sanson published in a composite Atlas, Atlas Contractus or Atlas Minor c.1696. He also published a further composite Atlas, Atlantis sylloge compendiosa, c.1702. The best known of the joint Pieter Schenk & Gerard Valck publications were the second edition of Andreas Cellarius's Celestial Atlas Harmonia Macrocosmica  and an edition of Jan Jansson's Novus Atlas entitled the Atlas Anglois published in London by David Mortier in 1715. Other works included his famous Atlas of one hundred town views, Hecatompolis ; Le Theatre de Mars ; and the Schouwburg van der Oorlog .